We've put out another small update for the Z1 software. Dashboard version 4.12.1; Server version 1.10.1; and Analyzer version 1.9.2. * Updated F1 2017 compatibility to the their 1.8/1.9 patch. 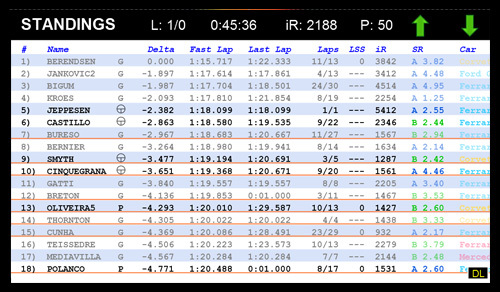 * Fixed a bug with Race Room that prevented the number of laps in a timed race from being properly calculated. * Laps Since Stop have been implemented for Race Room. Couldn't download demo. Will try again later today. What problems did you have trying to download the demo? We've released another small update to the Dashboard (v 4.12.2) and Server (v 1.10.2). * Fixed an issue with the Z1 Dash 1 that could cause the friction circle to be drawn off-center in certain circumstances. 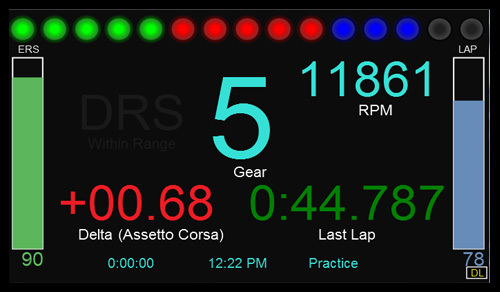 * Fixed an issue in the garage statistics screen where long car names could over run into the track length display area. * Fixed a bug that could cause the Dashboard not to update the track information (such as name, track map, etc) when connected to the Z1 Server if you changed tracks in the selected sim. So, you're in a race and coming up to your pit stop. The big question is when should you stop. Now in most road races you'll have a pit window that will cover several laps. Probably most of the time you'll base your stop on fuel. When you are about to run out you'll come in for a stop. But that is not always the best option. You need to take track position and the pit stop delta into account. This is where the Z1 Dashboard software comes in. All the Z1 Dashboard track maps can estimate where you will emerge on track after your pit stop. Once you get within several laps of needing to pit a section of track will become highlighted and have the words After Stop displayed near by. This section of track indicates the approximate location where you will rejoin after your stop. If you do a fast stop you'll be somewhere near the front of the highlighted section. If you have a slow stop you'll be somewhere near the back of the highlighted section. And as you can see this highlighted section follows you around the track as you drive. Looking at this track map image your car is located here. The highlighted overlay is displayed here. You can see that if you pitted at the end of this lap it is highly likely that you would come out in clean air. Lets look at a different scenario. Here is your car. And here is where you are predicated to be after your stop. You can see that in this case you will come out very close to some other cars. Based on this you can start checking multiple laps before your stop to determine the best time to make your stop so that you either come out in clean air or so that you come out ahead of a rival. The pit stop delta is displayed at the bottom of the track map here. PD 24.6 means the delta is 24.6 seconds on average for this track and car. Now it is important to note that the pit stop delta is not the time standing still. It is the total time lost during a pit stop. So that includes the in lap and out lap. If you drive a faster in or out lap you'll gain time on competitors who do not do so, even if the time standing still is the same. Now let's look at how you can customize this feature to your liking. To do so you should open the Strategy tab of the settings dialog. The first option at the top left is the Laps To Stop option. This lets you specify the number of laps of fuel remaining in the car when the highlighted section of track will start to be displayed. Next is Pit Stop Time. This is how the pit stop delta is determined. 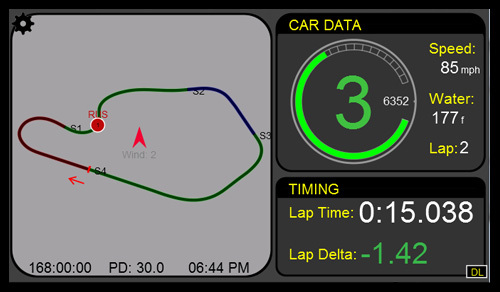 The Z1 Dashboard lets you enter a pit stop delta yourself, or you can set it to Auto and have the software calculate the delta based on previous pit stops. Note that if you enter the pit stop delta yourself, or if there are not enough previous pit stop times available to create a valid range, then instead of seeing the highlighted section of the track map you will see a single square following you around the track. The next two options deal with the track highlight. You can choose to display the track highlight as a square even if enough data is available to show a track highlight. Setting the Display range option to No will always use the square even if the highlight could be used. The Range Width determines the width of the highlight range overlay. The larger the number the wider the highlight overlay. Finally in the middle column we have three options that deal with text. The highlight has the words 'After Stop' displayed next to it. If you do not want these displayed change this option to No. The After Stop Color and After Stop Size let you chose the font color and font size of this text. So using all these options together lets the Z1 Dashboard software help you make the most informed decision on when to make your pit stops. You don't want to risk pitting at the wrong time, as a badly timed stop can mean losing the race, but a correctly timed stop can help win you the race. So make sure you are using the Z1 Dashboard track maps to their full ability to help you get the best possible result in your race. Version 4.13 of the Z1 Dashboard is now available! It is now fully compatible with Project Cars 2 and also takes advantage of the Codemasters 2017 Broadcast mode. 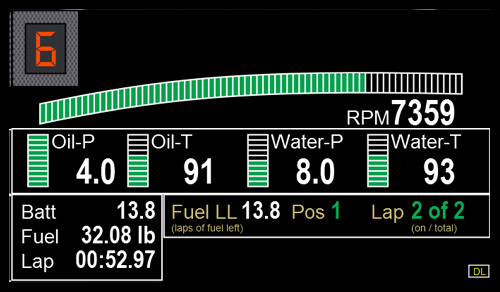 In addition many dashboards have been updated with better graphics, such as the Lotus 79, Skip Barber, Spec Racer and more. Shadows have been added to many of the analogue gauges. And of course there are new dashboards. The updated Lotus 79 dash with shadows. An alternate version dash with fuel level replacing fuel pressure. The new F1 style dash. The new Porsche LMP1 919 style dash. * Now compatible with Project Cars 2 using the Shared Memory feature within Project cars 2. * Now compatible with Codemasters F1 2017 Broadcast mode. There is a new option in the Network tab drop down for Codemasters called 'F1 2017 BC'. Select this if you want to connect to the sim using the broadcast mode option. 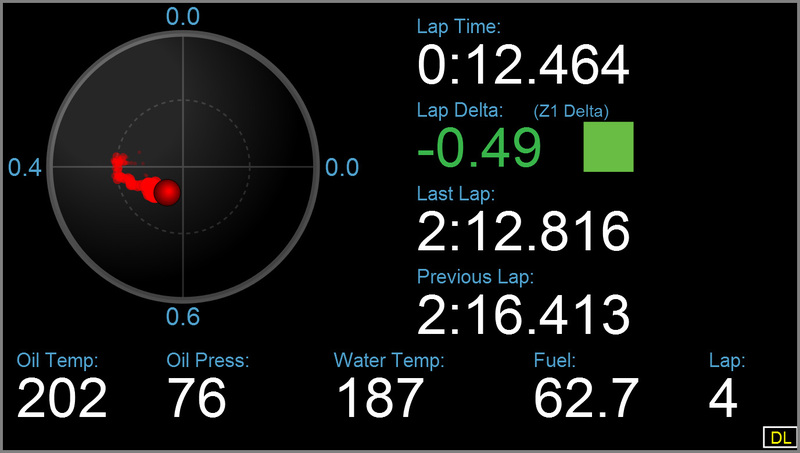 * Added a new stock car 2016 dashboard (#6). * Added a new dashhboard for the Porsche 919. * Added a new Formula 1 dashboard (F1 2014 #8 ). This adds a bar for the amount of ERS you have available during the lap. * Added a new version of the Legends Ford dashboard. This is called Legends Ford B. It replaces the fuel pressure gauge with a fuel level gauge. 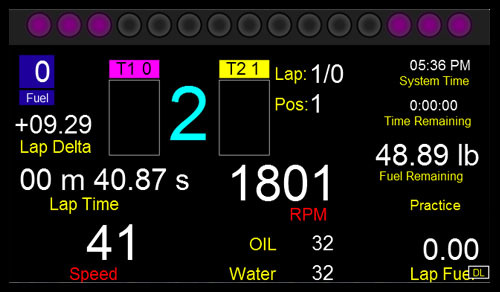 * Added a new version of the SK Modified dashboard. This is called SK Modified B. It replaces the fuel pressure gauge with a fuel level gauge. * Added a new version of the Monte Carlo SS dashboard. This is called Monte Carlo SS B. It replaces the fuel pressure gauge with a fuel level gauge. * Added a new version of the Silverado dashboard. This is called Silverado B. It replaces the fuel pressure gauge with a fuel level gauge. * There is now an option to view the track map when in the garage screens. Display the drop down menu to see this new option. * Some dashboards now have shadows cast by the needles onto the dials where appropriate. This feature can be turned off in the Display tab of the settings dialog by setting Shadows to off. Dashhboards with shadows are: RUF 8,000 RPM; RUF 9,000 RPM, RUF RT 12; RUF RT 12 10,000 RPM, IMSA Dash 1, IMSA Dash 2, Lotus 49 Dash, F1 1980s Dash, Lotus Elise SC Dash, Skip Barber Dash, Spec Racer Ford Dash, Lotus 79 Dash. * Added a new delta option for Assetto Corsa. Selecting this option will use the Assetto Corsa built in performance meter timing for delta displays on the dashboards. * Improved the look of the scrollbars in the settings dialog. * Improved the scrolling in the settings dialog that use scroll bars. 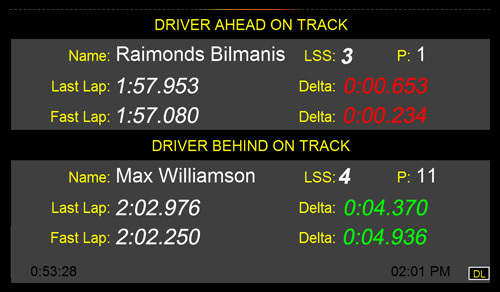 The Track driver list can now be scroll up or down using the mouse wheel. * There is now an option in the Display tab called 'Settings Loc'. If you set this to No then the Z1 Dashboard will not check to see if the settings dialog will be off screen when it is opened. This may help in certain circumstances if the settings dialog does not appear over the Z1 Dashboard window or gets moved to another monitor. * Updated the LED images in the CAR 3 tab of the settings dialog to use AntiAliasing for a better look. * Added a Button debug mode to help diagnose any potential button issues. * The Tire Dash now displays Camber in the tire diagrams for the sims that support it. * There is now an option to circle the cars driven by drivers who are on your tracked driver list when they are displayed on the track map. This feature can be turned on or off in the Tracked tab of the settings dialog. The color used to circle the cars is the currently selected highlight color. * The Dashboard will now display a confirmation dialog if you are trying to connect to an instance of the Z1 Server that is running on the same machine as the Dashboard. This is because such a connection is not necessary. However if you really want to establish such a connection and don't want the warning message to appear then tick the checkbox for "Allow local server connections" in the Network tab of the Dashboard's settings dialog. Version 4.13 of the Z1 Dashboard comes with some new dashboards, several variations to existing dashboards, some graphical updates, and the introduction of shadows. The new dashes include one for the Porsche 919 LMP1; a new Formula 1 dash; and a new stock car dash. We've also made graphical updates that improve the looks of a dashboard or add shadows to that dashboard. These are the Z1 Dash 1; F1 1980s Dash, IMSA Dash 1 & 2, Lotus 49 Dash, Lotus 79 Dash, Lotus Elise SC Dash, RUF Dashboards, Spec Race Ford Dash and Skip Barber Dash. Finally we've added variations to 4 existing dashboards, replacing the fuel pressure gauge with a fuel level gauge. These are the Legends Ford B Dash The SK Modified B Dash The Monte Carlo SS B Dash and the Silverado B Dash. Version 4.14 of the Z1 Dashboard is here! This version brings several cool new features, and lots of new and updates dashboards. We've got 11 new dashboards, and 12 updates ones. In addition we've introduced brake lock level lights to many dashboards. There is also a new feature to alert you if a car is to your left or right. 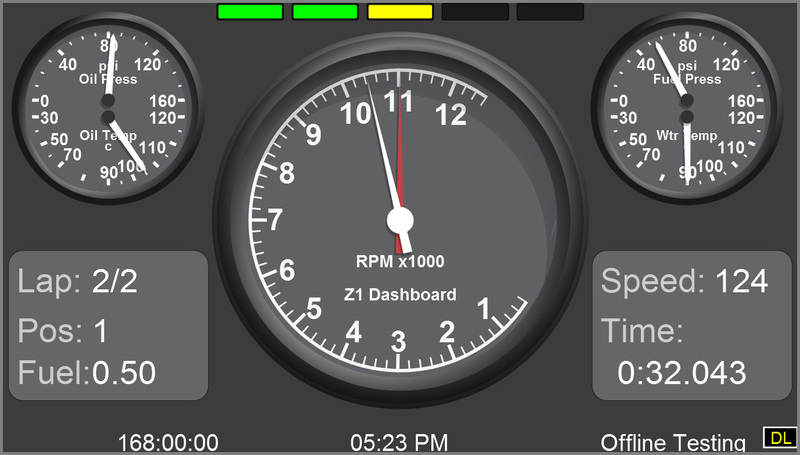 The latest version is available here http://z1simwheel.com/dashboard/demo.cfm. 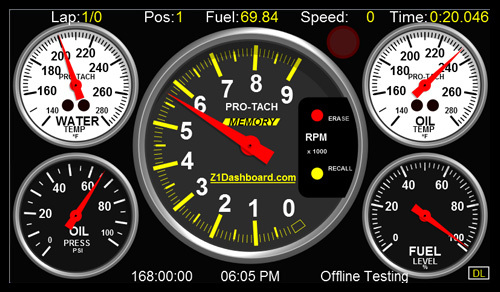 * Added 2 new dashboards for the VW Rally Cross car. These are called VW Rally Cross Dash 1 and VW Rally Cross Dash 2. These are similar, but have slight differences in the information displayed. * Added 2 new dashboards for the Ford GTE car. These are called Ford GT 2017 Dash1 and Ford GT 2017 Dash 2. * Added 3 new dashboards for the 2018 Indy Car. These are Indy Car 2018 Dash 1-3. * Added a new Z1 Dash 2 dashboard. 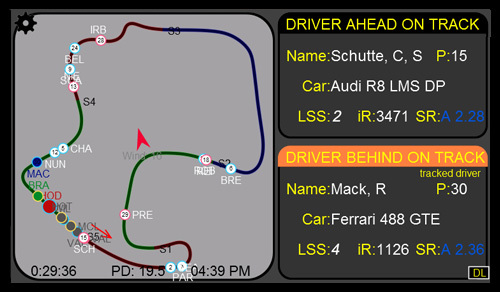 * Added a new dashboard intended for the Audi R18 and similar cars. * Added a new dashboard the the Porsche 919. This is called the Porsche 919 Dash 2 and is a variant on the first 919 dash form version 4.13. * Added a new track - Track Map 11. This incorporates a gear and RPM circle, with car speed, water temp and lap number, as well as the current lap time and delta time. * Added a new feature called 'brake lock level lights'. This works with any sim that reports wheel speed. Currently this is Assetto Corsa, Codemaster F1 sims, Kart Racing Pro, Project Cars 1 & 2, Race Room and rFactor 2. This feature allows you to use the left and right most 3 shift light LEDs to indicate when you are close to locking up the front left or right wheels. You can set the sensitivity of this feature in the Car 1 tab. There are three drop downs on the right labeled Lock Level 1 - 3. These control when each LED will be illuminated. The order of the LEDs is outside to inside. Settings the lock level to zero will disable the feature. The brakes must also be engaged to at least 15% in order for this LED to illuminate. There are two ways to set the sensitivity, the first is using speed. With this setting the number you choose in the first drop down is the difference in wheel speed between the front wheel and the rear wheel. This speed is in the currently chosen units. So if you have speed displayed in kph, and you have set lock level 1 to 15 Speed, then if you front wheel if rotating 15 kph slower (or more) than the rear wheel the LED will illuminate. The second option is Percent (Prcnt). When using this option the LED will illuminate if the front wheel's rotation speed is the selected percentage less than the rear wheel rotation speed. So if you selected 15 Prcnt, then if the front wheel if rotating at a rate of 15% (or more) less than the rear wheel the LED will illuminate. Note for the sims Project Cars 1 & 2, Race Room and rFactor 2 you must use the percentage option. You may set the sensitivity of the LEDs on a car by car basis. The color of the illuminated LED can be set in the Car 3 tab. This color is the same for all dashboards for the selected car, but can vary between cars. The following dashboards support this feature: V8 Super Car Dash, Corvette C7 Dash, Corvette Dash, Cadillac CTS-V Dash, Dallara Dash, DW 12 Dash, Daytona Prototype Dash, Ford GT Dash, Generic Dash, LMP Dash, F1 9180 Dash, all F1 2014 dashes, Ford GT 2017 Dash 1 & 2, Formula Dash 1 & 2, GT Dash 1-3, Mazda Miata Dash, Star Mazda Dash, VW Jetta Dash, Kart Dash 1 & 2, Track Map 2. * The brake lock level lights are now an option for the left and right LEDs on the SMZ1 wheels. You can select if one or more of these lights should be used for this purpose in the Car 3 dialog. This can be set on a car by car basis. The left LEDs will illuminate for data regarding the left front wheel. The right LEDs will illuminate for data regarding the right front wheel. * Graphical update have been made to the following dashboards: Silverado, Silverado B, Legends Ford, Legends Ford B, Monte Carlo SS, Monte Carlo SS B, Silver Crown, Street Stock, Super Late Model, SK Modified, SK Modified B and Sprint Car. * Shadows have been added to the following dashboards: Silverado, Silverado B, Legends Ford, Legends Ford B, Monte Carlo SS, Monte Carlo SS B, Silver Crown, Street Stock, Super Late Model, SK Modified, SK Modified B and Sprint Car. These can be turned off by changing 'Draw Shadows' to 'No' in the Display tab of the settings dialog. * There is a new option in the Car 1 tab called 'Show Wings As'. (Scroll to the bottom to see it.) This determines how the rear wing adjustments are displayed. The default is 'Number'. Most cars will use this and the wing adjustment will be displayed as a basic number (ie, 1,2,3...). The new alternative option is 'Distance'. This will display the wing settings as a distance (or measurement). So you will get readings like 1", 2", 3", etc. This distance will be in either inches or millimeters depending on what your current Distance Units is set to (in the General tab). * There is a new option to alert you to cars on your left or right. This can be turned on or off using the 'Spotter' setting in the General tab of the settings dialog. A yellow arrow will appear on the left or right of the dashboard to indicate the presence of a car. If more than one car is on you left or right then two arrow will appear. Note this feature currently only works with iRacing. Version 4.14 introduces the Brake Lock Level Lights feature, which works with any sim that reports wheel speed. This feature allows you to use the left and right most 3 shift light LEDs to indicate when you are close to locking up the front left or right wheels. You can set the sensitivity of this feature for each of the three LEDs on a car-by-car basis. You can choose to have the LEDs illuminate based on speed differences, or overall percentage differences between the front and rear wheels. I keep looking at this very tempted but not sure how I would work it into my setup. Is the demo timed or just limited features? It is timed. You need to restart it every 15 minutes. 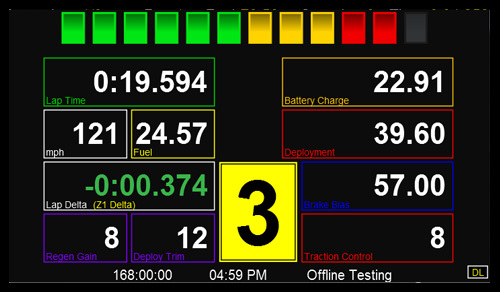 With the release of version 4.14 of the Z1 Dashboard there are now 59 various dashboards available for oval cars. Some are new in this release, like the Indy Car 2018 dashboards, some have been updated with improved graphics and shadows, like the Silverado, Silver Crown, Legends Ford, any many others, and some have been around of many versions now. Take a look and see which ones are right for you! 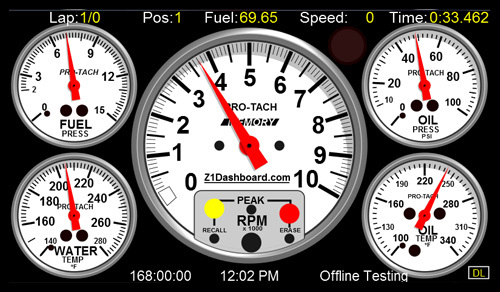 There are now 95 different dashboards available for road cars in the Z1 Dashboard software! You can check them all out here: http://www.z1simwheel.com/dashboard/road.cfm. Take a minute to scroll through them all and make sure you are using the ones you like the most with your sim. And remember you can have up to 10 dashboards associated with a car and page through them while racing! 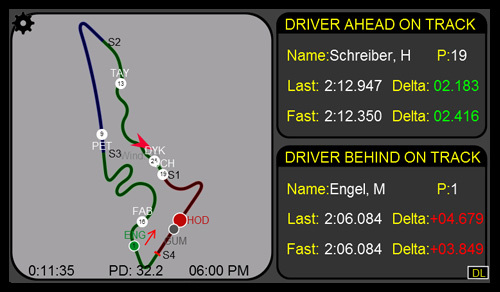 Can you tell me, is there a dash available in Z1 that is similar to the timings one in iRacing, where the relative live timings and different multiclass categories are shown? The Standings 2 dash might be what you are looking for.